When I was in high school I thought doubt was the lack of faith. Somehow I assumed very bad things were in store should I take my last breath before I was able to banish all questions about the existence of God, the Christian confession of Jesus as God in human form, and the resurrection as a real event that pointed to life beyond the grave. I spent many sleepless nights afraid of my doubts. I feared not having enough faith. Questions about everything I had ever been taught about Christianity, the Bible, and what it meant to follow Jesus were linked to mistrust and even sin lurking at my door. So I refused to share my doubts and instead adorned a personality and characterization as someone who had it all figured out. I also lived in fear. Every time a doubt about ________ popped into my head, I dreaded laying my head down on the pillow that night. I feared falling asleep. I wondered if I would ever be able to sleep. Then I met Thomas in John 20. He became my favorite disciple by far. While this disciple is often characterized as a doubter, "Doubting Thomas," he really is the only disciple with enough audacity, courage, and faith to dig deeper into the rumors of Jesus' supposed resurrection. Did it really happen? Seriously, I need to experience Jesus' renewed life firsthand. And he did. Thomas would even go on to be one of the earliest and most effective missionaries of the first century and Christian history. Some suggest he brought the gospel to India. I am sure he never stopped doubting and asking the hard questions. I also met this anonymous father in Mark 9. The disciples, and surely the father, are frustrated by their inability to heal this man's possessed son. They had done everything Jesus had commanded and said all the right things in efforts to prevent this child from a premature death sparked by some sort of demonic, seizure-inducing possession. So when Jesus asked the father a few questions, he responds with a bit of jadedness, cynicism, and doubt, "but if you are able to do anything, have pity on us and help us!" Jesus retorts right back, "If you are able!- All things can be done for the one who believes." I imagine the father pausing, thinking to himself, that's the problem. You don't understand. We have tried everything. I have lived all my days in fear that this would happen and there would be nothing left. I feared my doubts would win in the end. I believed only to be disappointed. Yet I believe, Jesus, help my unbelief! This is quite possibly the greatest prayer recorded in Scripture. It's one I pray quite regularly. And every now and again I am given a glimpse of resurrection, like the child in Mark's gospel who is lifted from a coma, and invited to hold on hope for another day. Yet when I have recently pondered faith and doubt, I cannot think of a more faithful witness to the good news of God's grace than one of my most beloved college professors and mentors, Dr. Dwight Peterson. Thanks to Dr. Peterson, I will never read one of my favorite gospel stories the same again. I also will never fear doubt again, or at least when I do, I will look to those who know where to find faith. I am not sure what exactly happened between the age of Thomas and 2014 (suggestion: the Enlightenment), but faith and doubt have assumed the role of opponents. They are like opposite sides of a coin, protagonist and antagonist of a great narrative. While we live in an age of cynicism, celebrate mystery, and shove aside anything wreaking of absolute certainty, the Christian church has managed to cling to the false dichotomy: faith v. doubt. Those who follow Jesus, especially heroes of the faith and brilliant theologians like Dr. Peterson, never doubt, right? At least they shouldn't, correct? Yet faith needs doubt. 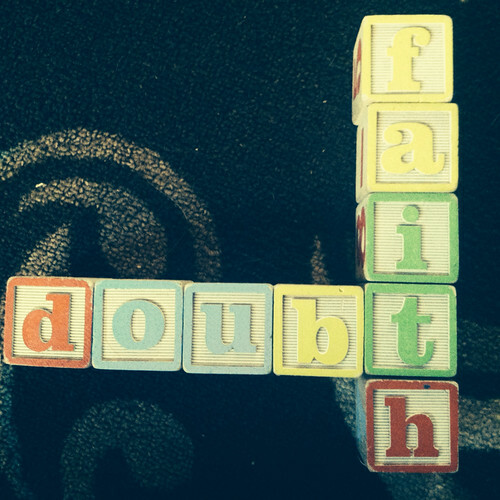 Doubt demands faith. They are far from opposites and, when you scan the pages of both history and Scripture, one of the most common traits of those called and used by God has been, not faith, rather doubt. I wonder if that's because doubt pushes us towards one another, reminds us that we cannot do life alone, and moves us beyond the idol of certainty that none of us will ever be able to appease? This does not mean quest for more doubt, it simply means doubt is not our or the church's enemy. There is nothing in all of creation that can separate you from the love of God in Christ, neither death nor doubt...not even doubting this to be true. You are not alone in your doubts; the faithful have always been doubtful. Doubts are not to be pursued alone. Doubts are to be confessed and adventured through alongside others and within the community of faith. Gone are the days of burning heretics at the stake, so you are safe. Well, some may talk about you in a few books/blogs by certain authors and publishers, but they are not worth reading anyway. Yet God loves them, too. Doubt can often lead to stronger faith and a more honest and authentic witness. But not always. Intellectual and academic certainty has never been the goal of discipleship. Trust, obedience, and a concern for our most vulnerable neighbors are more telling fruits of those who claim to follow Jesus. Faith is not the absence of doubt. And doubt is certainly not the absence of faith. They push on one another and draw God's people closer to Jesus, who is the object of our faith, subject of our hope, and Lord of all things seen and unseen. Doubt becomes a demon when we become so steeped in cynicism that we no longer know how to love and live with joy. Faith becomes an idol when we no longer make space for our doubts and/or the doubts of others, falsely assuming we have figured everything out and have a cpyright on truth. Jesus doubted. If you question, just take a look at his prayers before the crucifixion. Maybe read Psalms, which N.T. Wright calls "Jesus' prayer book." May the God who made and loves us all, draw us ever closer to the One who lived and died for us all, and fill us all with God's Spirit. And may the perfect love of this God cast out all fear...especially when we doubt. *A great chapter in, The Theological Turn in Youth Ministry, by Andrew Root and Kenda Dean: "Doubt and Confirmation."